In this concluding chapter, we discuss an evolving, experiential design framework for game-based learning platforms, by synthesizing the salient design problem-solving events, experiences, and solution-exploration findings reported in the previous chapters. 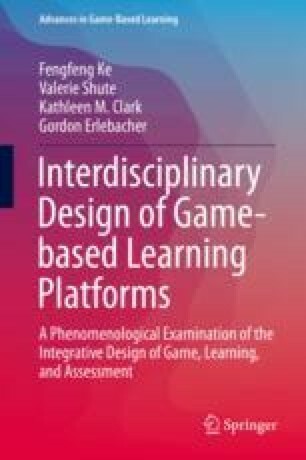 It is not aimed to be prescriptive or exhaustive, but acts as a starting point for specifying the structuring and important concepts of the interdisciplinary design of game-based learning. Results of our phenomenological inquiry assert that solving a game design problem is mainly about problem structuring or transforming an indeterministic problem space to partially limited. The structuring of the interdisciplinary design of game-based learning platforms consists of three norms: (a) transformation of the design goals into functional specifications of the design artifact, (b) coevolution of the problem and solution spaces as well as exploration and syntheses of partial solution of the subproblems, and (c) use of a common symbol (or representation) system to communicate and focus information while augmenting collective memory and processing. Togelius, J., & Schmidhuber, J. (2008, December). An experiment in automatic game design. In Computational intelligence and games, 2008. CIG'08. IEEE symposium (pp. 111–118). https://doi.org/10.1109/CIG.2008.5035629. IEEE Xplore.